The ANGAU Hospital in Lae Morobe Province has received a new portable cool room to meet the demand for meals to inpatients. The cool room will increase storage capacity for perishable foods at the hospital and will assist in meeting the increasing demand for fresh meals from the kitchen facility. The hospital kitchen caters for over 450 inpatients per meal and the portable cool room is among a number of improvements identified in the ANGAU hospital redevelopment masterplan. 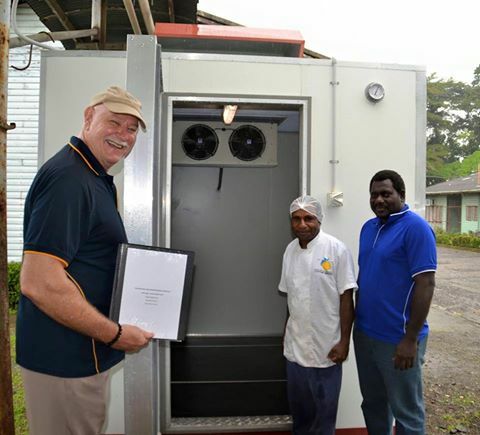 ANGAU Hospital Chief Executive Officer, Dr Kenyhercz, thanked Australia for the assistance given to ANGAU during the official hand over of the cool room. “We have seen so many improvements taking place at the hospital in recent months. Just in the last few weeks we have received a new forklift, bed frames for our staff units, a major electrical upgrade and now a new cool room for the kitchen. Australia is funding a program of works to upgrade essential infrastructure at ANGAU Hospital.